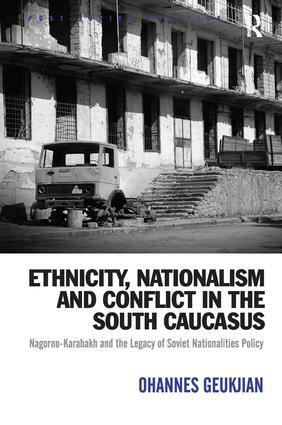 This book examines the underlying factors of the Nagorno-Karabakh conflict in the South Caucasus from 1905 to 1994, and explores the ways in which issues of ethnicity and nationalism contributed to that conflict. The author examines the historiography and politics of the conflict, and the historical, territorial and ethnic dimensions which contributed to the dynamics of the war. The impact of Soviet policies and structures are also included, pinpointing how they contributed to the development of nationalism and the maintenance of national identities. The book firstly explores the historical development of the Armenian and Azerbaijani national identities and the overlapping claims to the territory of Nagorno-Karabakh. The author goes on to assess the historical link between ethnicity and territorial location as sources of ethnic identification and conflict. He examines how identity differences shaped the relationsa between Armenians and Azerbaijanis during the different phases of conflict and presents a detailed historical account of Soviet nationalities policy and ethno-territorial federalism - the basis of which ethnic relations were conducted between governing and minority nations in the south Caucasus. This invaluable book offers students and scholars of post-Soviet politics and society a unique insight into the causes and consequences of this long-standing conflict. Ohannes Geukjian is an Assistant Professor at the American University of Beirut, Lebanon.